Kirstie Simson is an award-winning dancer and teacher who has “immeasurably enriched and expanded the boundaries of New Dance” according to Time Out Magazine (London). 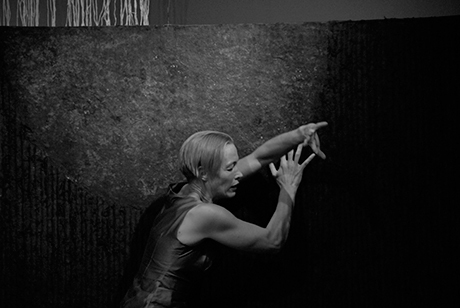 She has been a continuous explosion in the contemporary dance scene, bringing audiences into contact with the vitality of creation in moment after moment of virtuoso improvisation. For the past 30 years, Kirstie has collaborated with many dancers and musicians who share a common interest in improvisation, including Steve Paxton, Nancy Stark Smith, Simone Forti, Michael Schumacher, Adam Benjamin, Russell Malliphant and Le Quan Ninh. Kirstie was awarded a London Time Out Dance and Performance Award as “a unique figure in the dance world,” and Jennifer Dunning of The New York Times said of her dancing: “Kirstie Simson is justly celebrated in Britain for exquisite, sensuous dancing that seems to come from some simple force of nature.” She is renowned today as an excellent teacher and captivating performer who is a leading light in the field of dance improvisation. She shares this love in a documentary about her work, Force of Nature, directed by filmmaker Katrina McPherson. (An online video trailer can be watched at http://vimeo.com/34894689. The DVD and digital download is available in PAL and NTSC 16:9 through Amazon in the UK and USA , The createspace e-store and from the Goat Media website www.go-at.co.uk/Buy.html) In January 2008, Kirstie joined the dance faculty at the University of Illinois. Mothership: In the recent documentary on your work, Force of Nature, you offer some of your thoughts about improvisation as a training in receptivity, as a practice of awareness, as an outlook or way of life—can you share more of your thoughts on the perspective that improvisation offers? Kirstie: I suppose everyone that encounters this practice of dance improvisation will have a different relationship with it. From the very beginning this work had a profound effect on my life. In my second class of Contact Improvisation, which I took with the founder of this dance form, Steve Paxton, I had an epiphany moment where I suddenly understood that everything I would EVER need to know was already inherently within me, and that my work was going to be about stripping away all obstacles that could prevent me from deeply understanding and living this realization. Therefore this work has been a life-practice for me, and has offered me a perspective or an awareness of the great potential that life offers us always. Not one that you have to ‘build’ up around yourself, but ratherone that you have to realize from within yourself and then hold true to, working within that realization always as you move out into life and are confronted by life’s ongoing tests. This is possibly ultimately challenging, and yet deeply satisfying. I have always found teachers that have helped me along the way. When I began my journey with dance improvisation I did not realize that this would be the path that I would tread. All I knew was that I passionately wanted to learn about what this thing called life really was. From this perspective, wanting to become a ‘great or good’ dancer seemed irrelevant. Wanting ‘success’ in my career seemed ridiculous too. When I teach, I try to share my perspective on this work with people that come to study with me. MS: Our cultural conditioning often favors autonomy over mutuality, but with insights from the study of systems ranging from biology to economics to language, we may be wising up a bit. And yet, there’s still an anxiety of influence among some artists/writers, that is, an illusion of working alone instead of in conversation. Do you ever dance alone? What’s that like? And what about dancing with others? What are the challenges/riches of each? Kirstie: My dance practice has always been one of sharing with others. I see it as a communal activity that brings people together. In one sense of course you are always ‘dancing alone’, and yet the thing that has been of passionate interest for me is the realization that we are interdependent and not separate from each other. I have always wanted my dancing to manifest this quality of fearlessness in relationship with others. This is why I think the practice of Contact Improvisation is profound, as it is a huge part of the learning experience. Learning to relinquish the patterns of fear and lack of trust that keep us all separate is a huge undertaking. Yet in attempting to do so I have experienced, and see in others, that we become so much happier as a result and at ease with ourselves in relationship with our world. Of course this makes sense. Therefore I have never practiced dancing by myself or for myself. It makes no sense to me whatsoever. For me dancing is about sharing, whether in teaching or in performance. Collaboration in this sense is my greatest joy, which is literally what I experience when I am working with others. A huge smile spontaneously takes residence on my face. It always has done and I have learned everything from this. MS: And how does dancing change your relationship with space? In your film, you spoke beautifully about contacting another’s body in dance and not feeling solidity so much but more of a sense of the space within the form. Kirstie: I find this question difficult to answer as I always have a difficult time coherently understanding what space is. I understand space as a moving animal, and I understand it as a living breathing essence of something, that sounds mysterious but really is not. Because it is so, you cannot grasp it in form. It is everywhere within and without us. I have understood this on an instinctive level through the kind of moving I am interested in, which is not to do with image, or fixing form, or fixing anything at all. But rather to do with responding to the form-less, and moving freely in that. This is joy itself. This is why in the film I spoke about dancing with or through the space that is within myself and my partner, where we are one and the same, as apposed to being aware and fascinated by the apparent separation of the solidity of our two forms. Solid form holds no fascination for me whatsoever. MS: What would you say your materials are? MS: The actor Yoshi Oida talks about his work as “processing through the body to learn something beyond the body.” What do you think? Kirstie: I would agree with Oida. I don’t really know what he himself means or understands by that statement, but I like it, and I sense myself being able to respond to it when I read it. It is certainly what this work has opened up for me. Or perhaps it would be clearer to say that through this work I have been able to realize what it is I am truly interested in, which is indeed something beyond the body. MS: The body has a sense of betweenness for me, a paradox of inner and outer space/experience. One manifestation of this is performance, with its tension of the seeing body as body as seen. How do you work with it to reclaim dance from the deadly (negatively self-conscious) aspects of “performance”? What is dance if not “performance”? Kirstie: I am not sure I started out by considering the deadly aspects of “performance”. Something profound happened when I first encountered this work, and I have pursued that realization religiously as my practice. What has opened up for me is an ever-deeper understanding of how we are indeed not separate, that we are all one. So the practice has been about letting go of ideas of separation that inhibit this most glorious dance of oneness. In some respects the work therefore is about understanding more deeply the levels or layers of ignorance that we continue to adhere to, and through understanding them, being willing and able to let them go. This to me is what dancing is really about. The more that we are able to do this, the more we become an open channel. This desire to become an open channel has taught me how to observe myself and others. I have seen that when we dance or interact with others our own ‘inner tension’, which is another way of talking about the ignorant ideas that we adhere to, will cause disturbance to ourselves, to others and the world around us. You can see this SO clearly when people improvise together. And the more people are able to let go of this kind of tension, the more freedom will be realized in the dancing and interaction with others and the world, and the more joy will be liberated. This of course is revolutionary within the performance world. It is a totally different practice and as such can be both threatening and liberating to people who are involved in the deadly aspects of performance. MS: Performance and authenticity as well as the simple fact of open space itself (whether it’s public space, a blank page, or the future) are areas that bring up questions of control, of risk, of trust. Can you share a bit about how you have experienced (or teach others to experience) control, risk, and trust in ways that feed the creation of authentic art/life? Kirstie: By being centered in my own practice and understanding is the way that I affect others. I do not ‘intend’ to teach or affect others, I simply do my practice, and at this point in time I am doubtless about the worth of what it is that I am doing. Not as something that I have ‘created’ myself, but as something that I have had the good fortune to have been offered, or shown, and have responded to. From an outside perspective I am sure it looks as if I have taken many risks, that I have let go and discovered trust in the one-pointed manner in which I have pursued dance and my “career” – but none of this has been about self-conscious decisions to ‘do’ any of these things. It has simply been a choiceless response to what it is I have been shown. In the same way, when I teach I simply share my work with others, and if it has a positive effect on them or their lives, then I am glad. This is like a natural law of being. MS: You offer refreshing thoughts about the facile ‘suffering artist’ schtick here: http://www.youtube.com/watch?v=JVuuiAUiDvM And you’ve talked about improvisation dance as allowing you to be your fullest self (not narcissistically indulgent, but in Whitman’s direction of “containing multitudes”). This seems like a powerful outlook to share with people in our externally-oriented culture with its undertow of scarcity mentality. Can you share more about your insights from dance on the richness of simply being? Kirstie: I think I already said quite a lot about this in what I have already written. I suppose what I see in myself is that I have always been passionate about staying in touch with ‘life’ at all costs. Because of this I feel the force of life surging through me and I let this dance me. I let this show me how to live. The outcome is that fundamentally I am very happy and I know joy. This kind of joy and happiness has nothing to do with anything outside of myself, like falling in love, etc. In certain areas of life I have been lucky and in others not so. This kind of joy and happiness has NOTHING to do with life in that way. How I am in life is supported by this knowing, and whatever other people get from this is not for me to judge. I know that I love people, I love communicating, I love interaction, I love life and I live to learn from all of it. This to me is dancing.